A hot and spicy North African lamb sausage, seasoned with Harrisa spices. 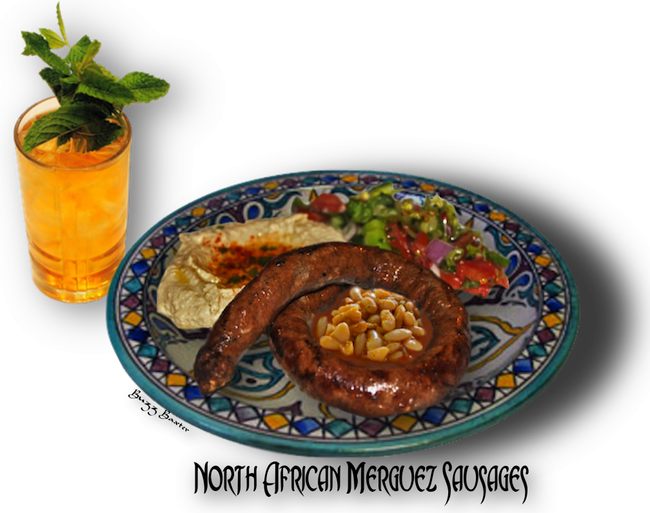 This lamb sausage is a favorite dish throughout North Africa. Lamb sausage is not made often in favor of pork or beef. This sausage is a bit spicy with the seasonings mimicking the African spice mixture called Harrisa. You can lighten up on the cayenne or red pepper in the recipe to make it less hot. ⅛ inch plate again with a stuffing horn attached into hog casings** (SEE COOK'S NOTES). Twist or tie into 5-inch lengths. 2. Serve with Moroccan white beans, cucumber salad,  hummus and Moroccan iced tea. *NOTE: I'm sure any good Jew or Muslim will substitute hog casings with lamb casings.